When you create a Webvanta site, you can choose from any of our SmartThemes. 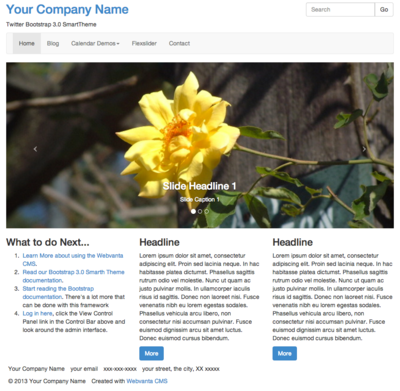 This theme is a great starting point for a responsive site. Refer to the Bootstrap Documentation to add on a wide variety of features including collapsible regions (accordions), modal widows (similar to lightboxes), tooltips, tabs, and more. A great place to start if you want lots of features all set up but plan to provide all your own styling. This is the moron of SmartThemes. It gives you absolutely nothing. 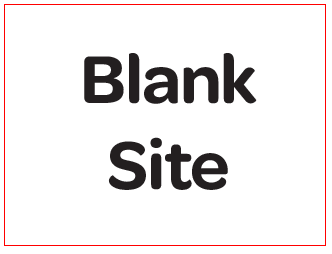 Except, of course, a blank slate on which to build your 100% custom Webvanta-powered site. 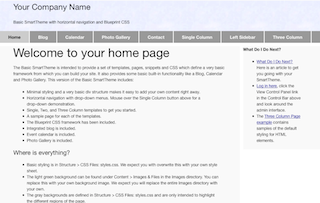 A SmartTheme is a starting point for building a Webvanta site. It encapsulates a complete definition of a site, including design, database structures, and even content, into a reusable package. Webvanta partners can create their own private SmartThemes.